Have you ever noticed that things taste better when you”re in the right surroundings? The beer and wine experience, especially, improves when you”re sharing with friends and doing it in a great space. That”s why San Diego”s best tasting rooms and brewery spaces are worth noting (and seeking out). Of course, great tasting rooms come in as many varieties as there are beers, so I”ve decided to offer a few thoughts on what I think are the best of the best in 10 categories (all of which have to also provide excellent beer). That way, you can decide for yourself which kind of tasting room experience will best suit your needs. This is by far the largest and most “designed” of Ballast”s 4 great locations, and it offers a nice mix of spaces in which to enjoy the wide variety of beers on tap. From the large bar, visitors can sit and look into the enormous production area, where two huge copper kettles are proudly displayed. Nearby, an area with comfortable sofas and chairs provides a more private option for those who want to sit and chat quietly. A large outdoor patio space gives sun worshippers still another option for sitting, sipping, and dining on treats from the kitchen, which offers a full menu. There is plenty of nice indoor space at this new Oceanside brewery, but the variety of outdoor space is what makes it unique. Upstairs, a rooftop patio provides good seating and tables, as well as a partial view of the water. 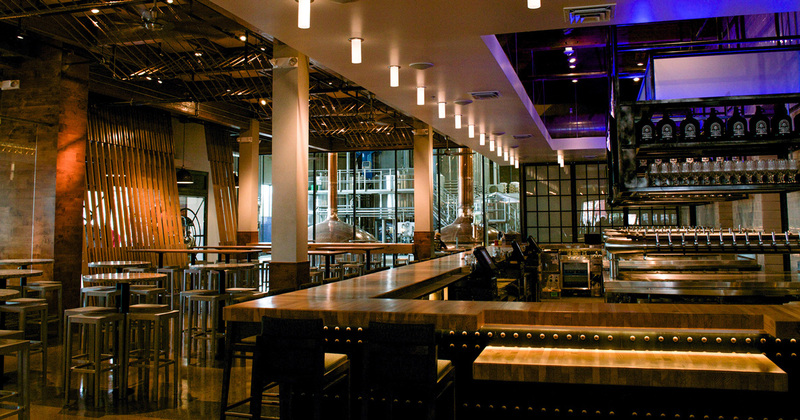 Downstairs, the courtyard area encompasses an Adirondack-equipped deck area as well as open-air seating with a view directly into the brewhouse. Another outdoor area surrounds a large bar and a brick oven that cooks up a nice selection of delicious items, including pizza. For a small, intimate, and comfortable room, Acoustic offers one of the best layouts in town. Overstuffed sofas and chairs add to the “speakeasy” feel, and a bar, high-top bar tables and chairs, provide the more traditional options. For a grander, more spacious option, Mother Earth features a very large bar, plenty of tables (some communal), and a nice outdoor patio space. > Find out more about Mother Earth Brew Co.
All of Pizza Port”s locations are fun, loud, casual, family-centric places, but their newest (and largest) location in Bressi Ranch is by far the easiest for kid-wrangling. Family-style picnic tables fill the large space downstairs, and a balcony area upstairs provides a (tiny bit) quieter option. Outside, a fire pit online casino is surrounded by cushioned sofa seating, which provides a comfy spot for sipping as the sun sets. It”s no coincidence that these two places are owned by the same guy, Scot Blair, who also owns Hamilton”s Tavern and Small Bar. Blair”s vision for all his establishments is to provide a welcoming, casual, accessible atmosphere for enjoying great beers. His newest venture, South Park Brewing, combines a small-batch on-site brewing operation with a casual seafood pub. The large wooden communal tables and booths are perfect for families and groups, and the vibe is no frills, relaxed, and friendly. Monkey Paw is more of a traditional pub atmosphere, with large dark-wood tables and a killer selection of craft beers, including great brews made right next door. The large warehouse space that houses one of Modern Times two tasting rooms (the other in North Park) provides a somewhat unique opportunity to enjoy an abundance of air above your head – it feels a little like tasting beer in an airplane hangar. But that”s cool. The high ceilings also provide walls that serve as mega canvases; in this case, one wall has been covered with a giant mural by artist Amy Krone, who constructed the image with more than 12,000 Post-It notes. Other funky design elements include the bar made from hundreds of antique books, and a state-of-the art hi-tech growler station that fills with no foam. Most breweries in town do a great job with the menus they provide, but only one offers a truly excellent thin-crust brick oven pizza; that”s URBN Street. There are plenty of other tasty items to choose from, but the combination of great wood-fired pizza with a freshly brewed beer…well, let”s face it, that”s tough to beat. The large space provides plenty of options for groups and families to spread out, both indoors and out. For a more traditional “brewpub” menu, Karl Strauss offers a wider selection of specifically beer-centric food (don”t miss the black garlic fondue! ), all paired with their food-friendly excellent quality brews. One of the great things about Stone Brewing Co. is that they get to play big. Everything about their two main locations in Escondido and Liberty Station is well-designed, user-friendly, and large-scale. In addition to sampling from a stellar 40-tap lineup (and 100 bottles) at Liberty Station, visitors can play bocce on the bocce courts, watch outdoor movies at night, or hang around the fire pits or water features in the spacious beer garden. 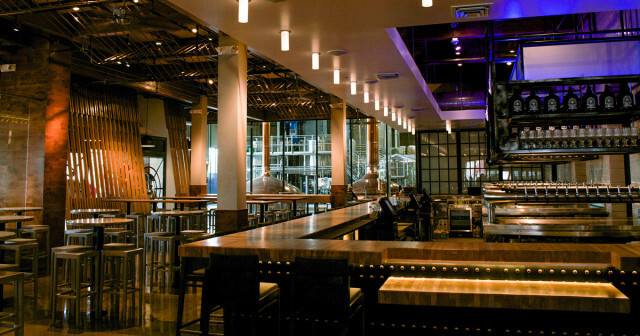 So many small breweries in San Diego have taken up residence in light industrial office parks, brewing in a square space with concrete floors and a rollup door. That”s great – most of those folks have lovingly made each of those spaces their own. Half Door, however, went an entirely different route. They set up in an old two-story house downtown, where a large Southern-style porch is part of the tasting space and the downstairs main room is the bar. The result is an unusually comfortable and homey vibe, where the unique space provides an extra boost to the enjoyment of Half Door”s top-quality beers. > Find out more about Half Door Brewing Co.
Lots of San Diego breweries have created their own beautiful settings in which to enjoy beer, but very few have access to a natural view. It”s not oceanfront, but the view from the patio at Amplified Ale Works includes a nice bunch of beach as well as views of the water. The open space is soothing, and there”s nothing more relaxing than sipping great beers while you inhale the unmistakable salty smell of the sea.